Cornell hypes on methane as a 'climate boogeyman' | Watts Up With That? Through the years, we keep hearing that methane, much like Trenberth’s missing heat, is going to jump out and get us. Usually, the panic about the “methane bomb” from frozen ocean floor methane hydrates or methane from melting Arctic tundra. Now, they are taking on methane as a danger from natural gas production, and suggesting we just skip it altogether and go straight to wind and solar. Yeah right, like that will work. Problem is, as this IPCC AR5 graph at right shows, the reality of atmosphereic methane seems to be far less than model projections. Plus, it seems to have an irrelevant contribution in the spectral scheme of all things GHG. ITHACA, N.Y. – As the shale gas boom continues, the atmosphere receives more methane, adding to Earth’s greenhouse gas problem. Robert Howarth, greenhouse gas expert and ecology and environmental biology professor, fears that we may not be many years away from an environmental tipping point – and disaster. Natural gas – that once seemingly promising link between the era of oil and coal to the serenity of sustainable solar, wind and water power – is a major source of atmospheric methane, due to widespread leaks as well as purposeful venting of gas. Howarth points to “radiative forcing,” a measure of trapped heat in Earth’s atmosphere from man-made greenhouse gases. The current role of methane looms large, he says, contributing over 40 percent of current radiative forcing from all greenhouse gases, based on the latest science from the Intergovernmental Panel on Climate Change. May 15, 2014 in Alarmism, Methane. if you really want a munch scream the last time the sun was here in the galactic year there was the Permian–Triassic extinction known as the great dying with 96% of all marine species and 70% of terrestrial vertebrate species becoming extinct. Sleep tight kiddies. Perhaps the author should educate himself about the dwell time of atmospheric methane, it is approximately 12 years. So living is a disaster now. It must be. Every advancement that has prolonged life has doomed life. First it was CO2, then nitrogen, now methane, we really need to get rid of that pesky atmosphere to save the earth. oh gawd, not the dreaded “tipping point!! !” again. Perhaps we should check all the records from the Eemian interglacial period left by humans (sarc), to see how they handled a global temperature at least 3 C more than what we are currently experiencing. And those poor souls did not have CO2 and methane to worry about. How did those chaps survive, anyway? 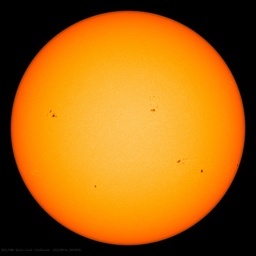 Once we get that mystery out of the way, perhaps we will all have a better understanding of climate and adaptability. Interesting: the AR reports didn’t consider the growth in nat gas use but the methane projection is much higher than observed. Coal use leads to more methane release than actual methane use? The sources of methane for the reports need reviewing. Corrected methane sources may correct CO2 emissions and temp projections. State of Fear — Since the CO2 boogeyman isn’t working out so well, we need another. Methane is another GHG, so it’s an ideal candidate. The real issue with nat gas & fracking is that it is killing the green dream of solar & wind power. Before unconventional plays got traction, nat gas prices were north of $ 10/mcf & solar & wind were starting to look a lot more cost competitive & the greens were excited by the prospect ! Now with abundant nat gas driven by fracking, nat gas is down around $ 4.50 /mcf & solar & wind are no where close to competitive & the greens are bumming out again. So, the greens solution – attack fracking with all sorts of patently false & alarming stories. Howarth’s push on methane as a dangerous GHG is just one more attempt to kill fracking with yet another alarming approach. Sorry, we aren’t buying it & all you are doing is further destroying any scientific credibility you & your fellow warmists might have ever had. Now, they are taking on methane as a danger from natural gas production, and suggesting we just skip it altogether and go straight to wind and solar. Yeah right, like that will work. That was the hidden plan all along. Robert Howarth, greenhouse gas expert and ecology and environmental biology professor, fears that we may not be many years away from an environmental tipping point – and disaster. It always “not be many years away“, or is that months or days or even hours!? This guy is a nutjob. What makes him think that Europe and the USA are going to turn away from natural gas because he warns of impending catastrophe. THAT IS NOT GOING TO HAPPEN. To back up my last paragraph countries have already stated pilot schemes to get at the methane hydrates in the oceans. Japan come immediately to mind. Does that sound like us moving more into methane or less? 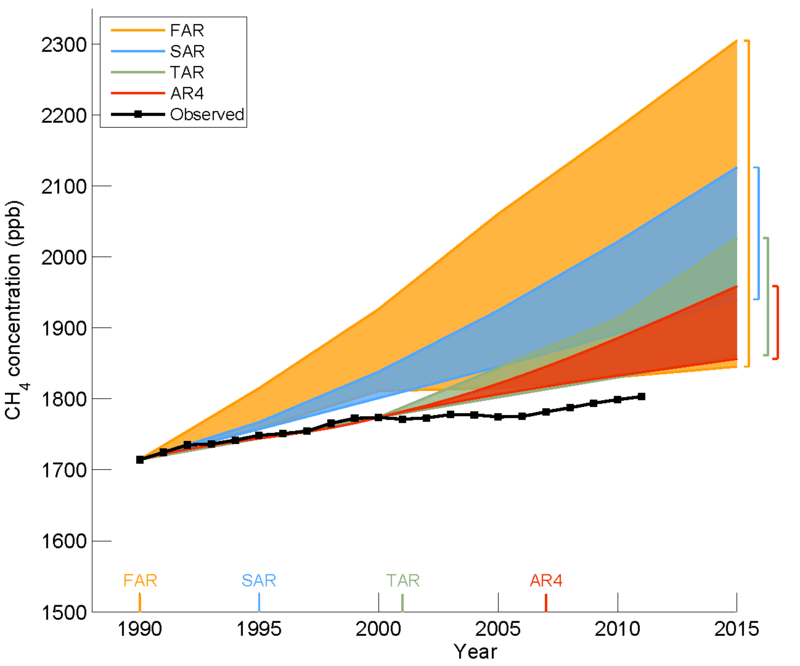 There’s no systemic problems with IPCC projections though. We evaluated that by expert opinion and we’re at least 97% confident that any similarity between graphs there is strictly coincidental. We don’t need no stupid fracking….just capture the cow farts. Let’s just kill & eat the cows. Problem over. Well the author cites a previous thread on this; but he clearly did not read that (entire) thread. It has been pointed out MANY TIMES in regard to both CO2 and CH4 also O3, that while these absorption BANDS may overlap, the INDIVIDUAL SHARP LINES that comprise these bands, AND THEIR ABSORPTION, do NOT overlap. So the match between water LINES, and CO2 or CH4 lines, is NOT what the author thinks, so his argument doesn’t hold water, and it is time skeptics understand this, because it makes us all look silly. Now there is a silver lining to this conundrum, as well. Just as these narrow spectral lines do not (generally) overlap those of another species, nor do they OVERLAP EACH OTHER !! So what looks like a wide brick wall, is actually a picket fence, and a great deal of OTHER LWIR wavelengths in those bands, just go whizzing right on through, GHG or no. If YOU PEOPLE do not read ALL of the posts in a thread, you may go away, with a half baked notion of what is actually going on. GHG atmospheric warming and atmospheric cooling delay, are physically real processes; that virtually nobody disputes. Those are NOT planks worth dying for. What ELSE gose on to counter those effects, is what is poorly understood at least in the Ckicken Little Encampment. So READ that earlier thread in its entirety, and stop with this silliness. I’m sure Phil must take heart medication, every time he reads these un-informed posts. I’m more afraid of Godzilla than I am of GHGs, particularly the benign CO2. But they DO have an effect. So does flushing your toilet twice, instead of once, have an effect on next week’s Surfing contest in Hawaii; but it won’t be cancelled as a result of your wastefulness. Since this isn’t my area of expertise, I wonder if anyone has done the calculations. How much would we reduce production of excess methane if we outlawed eating beans? Back when we were trying to permit hydro (water) power plants, they killed that one too. Said it was too tough on the fish, the birds, the trees, the flees and probably the Japanese. I was forced during the 1990’s to abandon some 15 small hydro projects in various stages of the permitting process at a loss of $ millions. Really… We are seriously discussing something said by a staff member of the Cornell University Media Relations Office? Melissa Osgood is the media relations specialist focusing on agriculture, food, nutrition, health, medical technology; and energy, climate and sustainability. She also coordinates media outreach and events in Boston featuring Cornell faculty experts. Previously, she worked in communications for the American Dairy Association and Dairy Council as well as a private high school in Buffalo, N.Y. She interned for several television and radio stations and holds a bachelor’s degree in communications from Hiram College. That’s the funding source. A mouthpiece for the trillion dollar wind and solar industry. “Robert Howarth, greenhouse gas expert” — ROFLMAO! I wonder when he became an expert in green house gases, was it during his B.A. at Amhert, during his non existent masters program, or during his attainment of a doctor of philosophy at MIT? I can only assume Prof. Howarth is referring to “the technologies of the 21st century” B.C. WHO GETS READ by the politicians, TV and radio news readers across the country, print media news re-writers across the country, the science editors of Newsweek, NYTimes, Washington Post, LA Times and San Francisco Chronicle National Geographic and its kin, and the speechwriters of 90% of today’s politicians? A n (equally-blind-and-dumbed-down-by-propaganda) “physicist” in a “climate science” curriculum whose only funding and publications and promotions and papers is supplied by the government? Or this staff member of the Cornell PUBLICITY Department, who used to specialize in the “cow” industry? That the Cornell publicist is a former cow publicity adviser actually puts her in a stronger position to influence policy, to make policy than the so-called scientist. Though both are spreading bullshitte widely and strongly. We need to arrange a meeting between Howarth and Godzilla, say about an hour after Godzilla has a hearty meal. Possibly the best chance nature can give him to study methane discharge. But, seriously – if Howarth has a press conference to announce his findings, he would be wise to inhale helium before and during, not methane . Large wind turbines require a large amount of energy to operate. Other electricity plants generally use their own electricity, and the difference between the amount they generate and the amount delivered to the grid is readily determined. Wind plants, however, use electricity from the grid, which does not appear to be accounted for in their output figures. At the facility in Searsburg, Vermont, for example, it is apparently not even metered and is completely unknown * The manufacturers of large turbines — for example, Vestas, GE, and NEG Micon — do not include electricity consumption in the specifications they provide. using the generator as a motor (to help the blades start to turn when the wind speed is low or, as many suspect, to maintain the illusion that the facility is producing electricity when it is not,‡ particularly during important site tours or noise testing (keeping the blades feathered, ie, quiet)) — it seems possible that the grid-magnetized stator must work to help keep the 40-ton blade assembly spinning, along with the gears that increase the blade rpm some 50 times for the generator, not just at cut-in (or for show in even less wind) but at least some of the way up towards the full rated wind speed; it may also be spinning the blades and rotor shaft to prevent warping when there is no wind. It seems to me that Progressives are building a case to outlaw NG is an alternative energy source (much like we knew they would). A decade ago, NG was being talked about as a viable, and clean source of energy. But, the minute it became apparent to Progressives that NG production was soaring in the US, NG became no better than coal. The script now is being written. Scientists will soon conclude studies that show NG even more harmful than coal, and the EPA will use said studies to regulate it into oblivion. <<<<<That the Cornell publicist is a former cow advisor actually puts her in a stronger position to influence policy, to make policy than the so-called scientist. No, sir. The practice demonstrates opposite to what you say. Therefore, IPCC has no cow advisor on staff. <<<<<Though both are spreading bullshitte widely and strongly. Oh no FRACKING!!! AAArrrrggghhhh Now its causing earthquakes too! If you’ve had success with sci-ency mythology over the span of 50 years throughout green history why wouldn’t you just repeat the schtick again? The truth is there is culture that has bought in to this authority, over a lifetime in most cases. By the time it is debunked another myth will be presented. I guess I missed something, but where is the data showing the amount of methane escaping from an average bore hole before it is capped. This is just a political document. Re; george e. smith – one lecture on absorption spectra (PDF) that seems to be a good background for some of the concerns regarding various greenhouse gases. As for Shawn in High River – both fracking (water injection) and water extraction from underground aquifers is indeed understood to sometimes generate earthquakes. Methane as a greenhouse gas is a serious danger through global warming! Quick, extract as much as we can and burn it to convert it to less harmful CO2 and H2O. I am so tired of the crap science. Carbon, hydrogen and oxygen are the foundation of organic chemistry. Why is organic chemistry a boogeyman. Blatant IDIOTS! Edited by Harpo Marx and peer reviewed by the Three Stooges. Have your fun and ridicule, but the bottom line is that increasing amounts of methane being dumped into the atmosphere is not a good thing. So what about people passing gas? Should this be outlawed too? You know, I’ve about reached the point of being past caring what those yahoos say. Reason: Whatever you want to build, somebody doesn’t want you building it there. I remember the huge fuss that was raised a few years back when a windfarm was built in DeKalb and Lee Counties, near where I live in Illinois. Most people living there didn’t seem to want it, and billboards went up all over the place demanding that the project be stopped. Don’t forget about the issues raised when somebody proposed a windfarm near the Kennedy compound. Oh, no– we’ll have to look at those things!!! Hydropower. We can get power from water. Great. Now propose building a hydroelectric dam and watch what happens next. I guarantee you’ll have a river full of “Greens” in no time looking for a bird, bug or fish that must be protected from your evil dam, and getting the thing built will require reams of paperwork in dozens of agencies, any one of which can put the ca-bosh on your new hydroelectric dam. Solar– OK, in order to produce meaningful power you have to have ACRES and ACRES of land available, and storage– in the form of evil batteries– to store power when the sun shines so you’ll have it when the sun doesn’t shine. Sooner or later– bet on sooner rather than later– somebody will figure out that a solar farm has a cost that negatively affects a bird, bug, critter or fish– and you’ll have Greens saying you can’t build that there. So– I’ve reached the point that I’m tired of hearing it. Whatever you want to build, somebody doesn’t want it there, so we might as well do what has to be done to live on this planet halfway comfortably. ahhhhh! ANOTHER tipping point. I’m getting tipsy. I have a degree from Cornell University. There was a time when I was proud of it. For the past 20 years or so, it’s been an embarrassment. Dear Lord – where to begin? 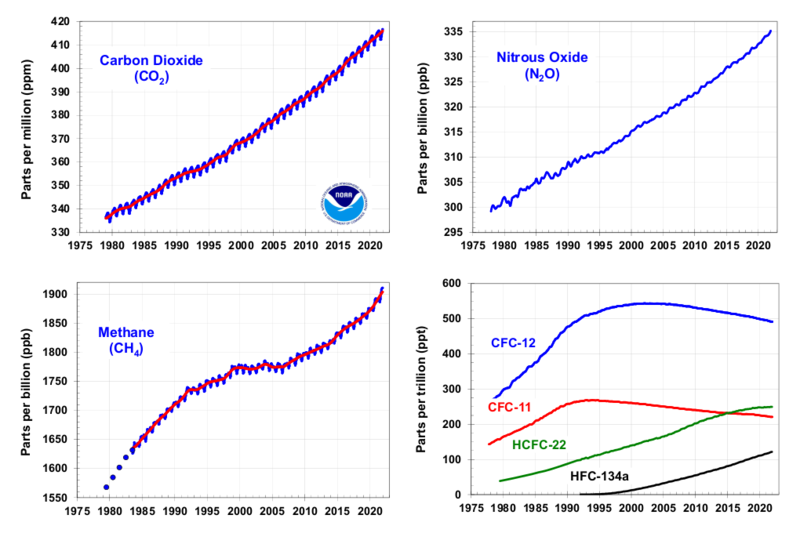 Methane CH4 is present in parts-per-billion concentrations, three orders of magnitude lower than CO2. And methane is easily oxidized in normal atmospheric reactions producing more CO2 and H2O. It doesn’t matter what methane’s long-wave radiation-absorption profile is – it’s insignificant. Jeez! this alarmism is annoying! To make GeologyJim’s point even more obvious, 1800 ppb is 0.00018% if the atmosphere. This infinitesimal part of the atmosphere is going to drive the whole climate off of a cliff? Really? So far, the alarmist crowd is batting .000 in their predictions. Atmospheric methane is leveling off, despite rising use of natural gas. So the methane scare does not compute. I always find it amusing that Ive never heard talk of all those missing swamps that before humans drained them were releasing large amounts of methane into the atmosphere. Methane is CH4. When you climb the hydrogen ladder in NATURAL gasses; propane, butane, etc., the more energy from burning them is derived from breaking Hydrogen bonds and the less from Carbon bonds. Burning methane and other NATURAL gasses produces far less CO2/kilocalorie/mole than traditional fossil fuels. Likely appropriate – after all Cornell used to also be called “cow college” by the more urbane of the Ivies. The point being, however, that the various pontifications by Howarth, Ingraffea, etc. (of course) may not represent everyone associated with Cornell, some of whom likely just cringe. I wonder how the Greenies are going to replace the millions of gas boilers that heat our homes in the short period of time that they saw we have before the world ends. Renewables is all about electricity but we don’t use immersion heaters any more. Switching back will cost billions and take a huge amount of effort. The push to insulate our homes has failed, so why will a plan to replace our boilers work? And all cars are going to be replaced in that same period of time. Just sheer logistics means that if we went all out and only replaced cars and boilers and did no productive work (including producing food) it would take decades. Too funny! I ask people who are against human progress how much CH4 (Once, one person said “CH4. Humm, 4 carbons) is in the air (And what is likely to be due to fracking etc lets forget termites for now) and the usual reposnse is 30% – 40%. I ask how much CO2 is in the air, the usual response is 30% – 40%. So in their mind upto 80% of the air is made up of CO2 and CH4. Then I ask that how is that possible when N2 and O2 occupy ~78% and ~21%, respectfully, of the air? I lead them to Wikipedia, which in this case is factually correct. I usually hear crickets chirping. They don’t get the fact that if what they believed were true we’d be dead, right then and there! 1800ppb/v is meaningless as a fact let alone a concept to most people. And as WonkotheSane: May 15, 2014 at 2:58 pm says 1800ppb/v is 0.00018% understood even less so. In my experience with these types of “cults” and “religions” is that most people just want to be seen to conform. It is easier to conform and “be like everyone else” than to speak out. About 2000 years ago, our Roman rulers had issues with one person speaking out, and being against the grain, and he was killed for it. Just look at the satellite measurements of LW infrared radiation coming up from the earth. The CH4 band is barely visible, while the CO2 and O3 bands are plainly visible. Howarth, if your faucet is leaking, the solution is stop using faucets? If you don’t like methane, don’t vent natural gas. Flare it so you get CO2 and water vapor. H2O being >90% of “climate”, I’m doubtful that Methane at 100× its current level would be significant. That just proves that human use of natural gas has nothing measurable to do with atmospheric methane levels. “Methane” is just another baseless alarmist scare. At 1.8ppm/v CH4, am I worried? Nope! If there is a real problem with CH4, we’d need to remove all termite activity from this rock. And given this is a virus, bacteria, insect rock…I don’t see that happening! I’m not grasping your point here. Seems to me that methane has a 4:1 hydrogen to carbon ratio, which maximizes the water to CO2 ratio when you burn it. A very long carbon chain molecule approaches 2:1 ratio, and benzene gives you a 1:1 ratio. So wouldn’t that make methane the preferred fossil fuel ? ?